SCVHistory.com | Tataviam Culture | Cultural Material from Blum Ranch, Aliso Canyon, Acton. Index of Tataviam Cultural Material from Blum Ranch. Accessioning in progress. More to come. LW.BLR18101: Arrow Shaft Straightener, 2 Grooves. LW.BLR18201: Hopper Mortar with Asphaltum. LW.BLR18202: Milling Stone, Smoothed Flat. Granite. LW.BLR18203: Milling Stone or Cooking Slab. Rhyolite? LW.BLR18204: Milling Stone, Concave. Pelona Schist. LW.BLR18205: Milling Stone, Slightly Concave. Bouquet Stone. LW.BLR18206: Milling Stone. Pelona Schist. LW.BLR18207: Milling Stone, Smoothed Flat. Pelona Schist. The 160-acre Blum Ranch was homesteaded in 1891 by George Blum, a Swiss stonemason who immigrated to the United States in 1880. The property straddles the Santa Clara River in the Aliso Canyon section of Acton, just below (north of) the headwaters of the river. The ranch remained in the Blum family until 2017 when it was sold (escrow closed in January 2018). The principal products of the ranch were stone fruit and honey. At various times from 1891 to 2017, the ranch owners collected Native American lithic materials that they found on their property. 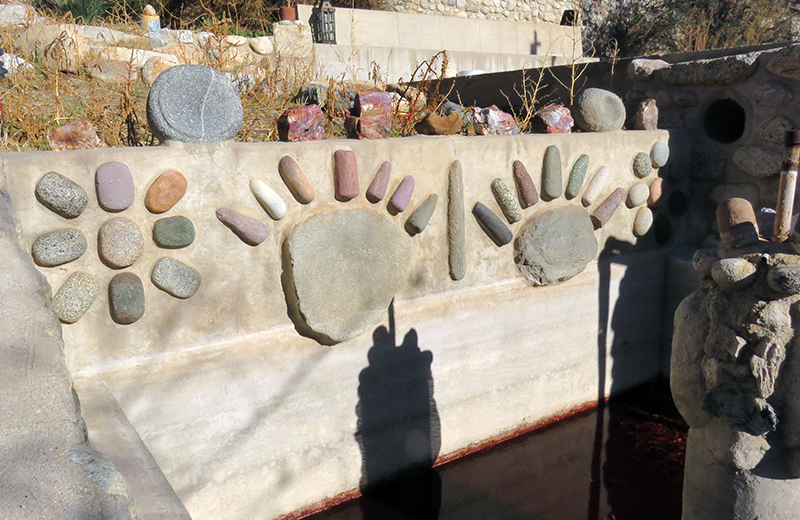 In January 2018, approximately 200 lithic items — primarily grinding stones (manos, pestles), one arrow straightener, four or five shallow bowls or dishes (possibly paint pots), and about a dozen larger ground stones and mortars — were obtained from the ranch owner/seller and are to be conveyed to the Ferandeño-Tataviam Band of Mission Indians, whose membership includes descendants of individuals living the Acton area prior to European contact. 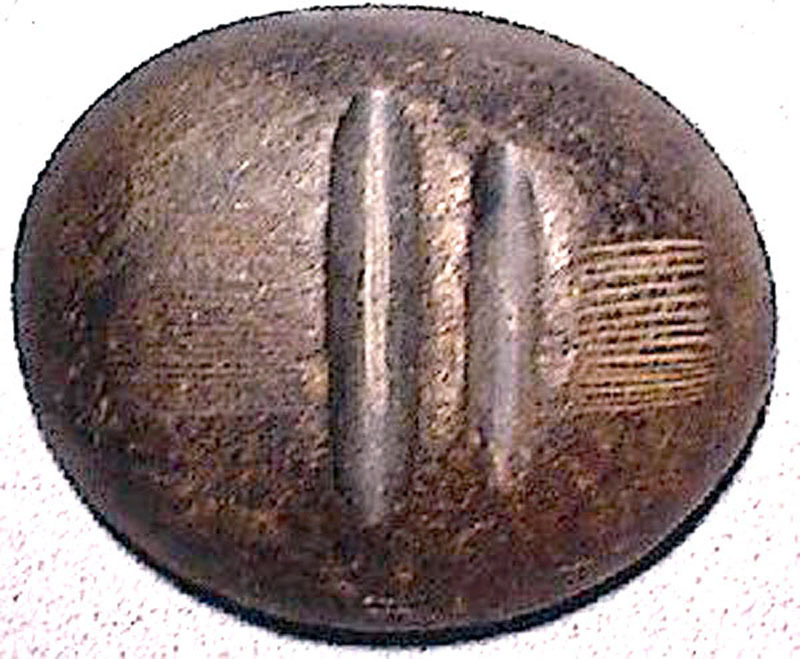 Some of the more unusual pieces, such as the (3) small, shallow bowls with incised lines, whose purpose is unknown, bear a strong resemblance to artifacts found elsewhere in the Los Angeles area and which have been dated to the arrival of Takic speakers (Tataviam, Tongva, etc.) about 1,500 years ago. See for example "A Selection of Specimens in the Palmer 1917 Collection from the Magala Cove Site, CA-LAN-138" by Henry C. Koerper in Pacific Coast Archaeology Society Quarterly, Vol. 53 No. 4, December 2017. Left behind at Blum Ranch (not retrieved) were approximately three dozen other grinding stones that were embedded as decoration in the cement wall of a fountain feature that was probably installed in the second decade of the 20th Century when the main ranch house was built (see photo). Tataviam people utilized the ranch property from the Middle and Late Prehistoric periods until sometime after contact was made either by Fages in 1772 or Garcés in 1776. Abutting the ranch on the south and extending southwesterly to the Santa Clara Divide is a 7,850-acre section of the Angeles National Forest that is designated a Special Interest Area because of its cultural significance. It boasts numerous "archaeological sites ranging from long-term occupation sites [to] seasonal encampments and special-use resource procurement, processing, and storage sites" (see fuller description below). One such site is the Aliso Junction Earth Oven site in Aliso Canyon. The oven was radiocarbon dated to 940-1,000 years ago (as of 2005), and the location continued to be inhabited at the time of historic contact by the Tataviam. In 2002, under contract with the USDA Forest Service, a group of Pierce College archaeology students led by Dr. Joseph S. "Noble" Eisenlauer conducted a field study immediately south of (upstream from) the Blum Ranch. Eisenlauer and others reported finding numerous small arrow points (bird points), rock outlines of house or possibly religious sites, burnt animal bone, and a variety of beads — shell and steatite beads from the coast, as well as European glass beads, the latter indicating continued post-contact presence. Note: It is a federal offense to remove anything from the forest without a permit. Multiple federal laws prohibit the removal of "Indian artifacts." This area is known for its heritage resource values. The Special Interest Area (SIA) includes many Native American archaeological sites ranging from long-term occupation sites, seasonal encampments and special-use resource procurement, processing, and storage sites. Of particular interest may be the numerous stone circle features so far found within the SIA, many of which are interpreted as house rings, storage caches, or religious sites. This concentration of stone circles may be unique in southern California. Also located within the SIA are several sites containing cupule rock art features. One of these sites is currently being nominated to the National Register of Historic Places. The span of Native American habitation ranges from the historic period to the Late and Middle Prehistoric Periods, and likely even earlier. Glass trade beads show evidence of Native American habitation in the historic period, and dates from arrow points, shell bead types, and C14 from earth ovens prove habitation in the Late and Middle Prehistoric Periods. Artifacts include objects manufactured from steatite obtained from the Channel Islands and obsidian obtained from the Owens Valley. These provide strong evidence of trade networks with desert and coastal groups. The SIA contains archaeological materials that provide a unique opportunity to obtain invaluable data related to past human life-ways and environmental adaptations, as well as paleoenvironmental conditions. The SIA encompasses Angeles National Forest administered lands within the Aliso, Arrastre, and Kentucky Springs Watersheds on the Santa Clara-Mojave Rivers Ranger District. The area of the SIA has many other national forest uses occurring, including a transmission line corridor (lines, roads), clay mining operation, National Forest System roads, Los Angeles County Roads, plantations, private in-holdings, and hiking and riding trails. Elevations range from 2,950 to 5,900 feet for the combined SIA with the elevations ranging from 2,950 to 4,000 feet for the segment of the SIA that appears in the alternative. The vegetation is primarily chaparral at the lower elevations and a montane chaparral mix with stands of Coulter pine, canyon oak, and incense cedar at the higher elevations. The SIA is located south of the town of Acton and north of the Santa Clara Divide. 1. "Macrofloral Analysis at the Aliso Junction Earth Oven Site, FS No. 05-01-55-159, California," by Kathryn Puseman and Jaime Dexter, Paleo Research Institute, Golden, Colo., August 2005. 2. 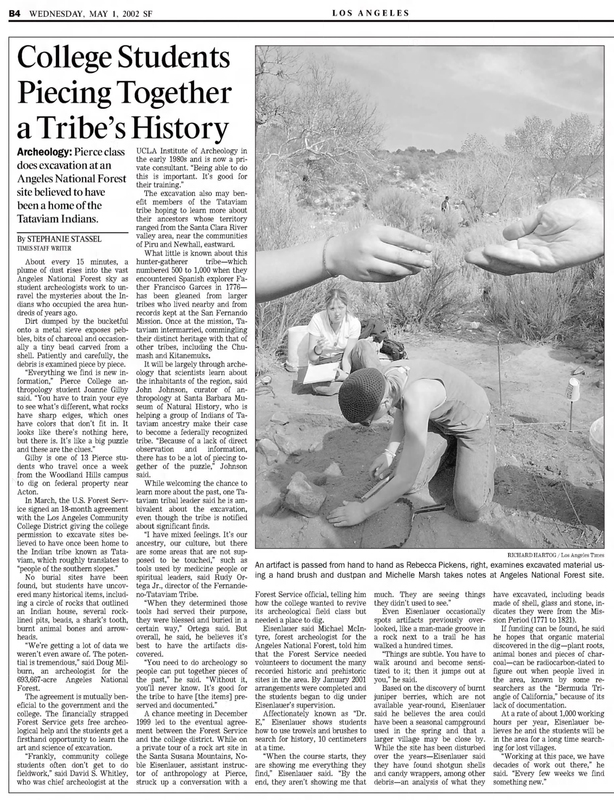 "College Students Piecing Together a Tribe's History" by Stephanie Stassel, Los Angles Times, May 1, 2002. 3. "Land Management Plan: Part 2 Angeles National Forest Strategy" (R5-MB-076), USDA Forest Service, Pacific Southwest Region, Arcadia, September 2005.